Wells Fargo is catching even more heat for alleged bad behavior, this time from the powerful SEC. The Securities and Exchange Commission's investigation was revealed by Wells Fargo in a regulatory filing Thursday. It joins an increasingly-long list of government agencies probing Wells Fargo (WFC) for issues related to the creation of as many as 2 million fake accounts between 2011 and 2015. The fake account mess, combined with ongoing scrutiny of Wells Fargo's mortgage tactics, has forced the bank to ramp up its legal defense fund. Walls Fargo warned investors that in a worst-case scenario, its litigation losses could be $1.7 billion "in excess of" what it's already set aside. That's up from an estimate of $1 billion as of August. If an "unfavorable" resolution is reached in any of the investigations, Wells Fargo said it may be "material" to its business. Wells Fargo didn't explain precisely what the SEC is investigating the bank for, other than that it relates to the "sales practices" that have landed it in hot water. Senator Elizabeth Warren recently asked the SEC in a letter to look into whether Wells Fargo violated whistleblower protection laws. 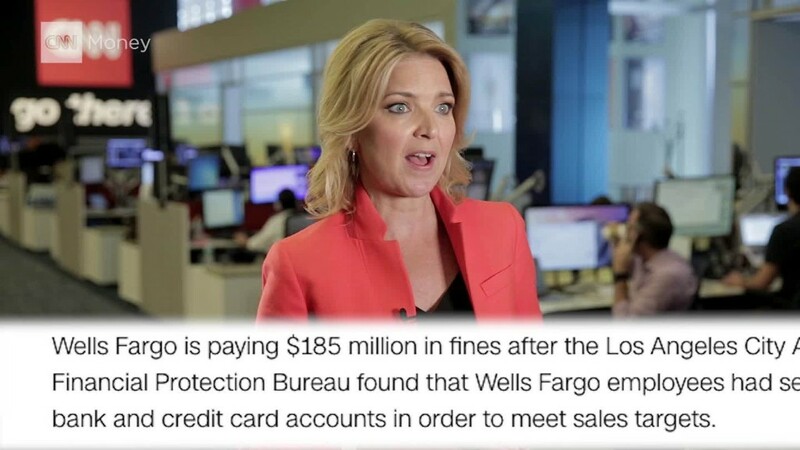 She cited CNNMoney's reporting on Wells Fargo employees who believe they were retaliated against for calling the bank's ethics hotline over the opening of fake accounts and similar issues. Beyond the whistleblower scrutiny, Wells Fargo has been criticized for not alerting investors to the problems inside the retail bank until it reached a settlement with regulators on September 8. Former CEO John Stumpf has said he became aware of the issues in 2013. And CNNMoney obtained a 2007 letter addressed to Stumpf that warned of "widespread" fraud. Warren, easily Wells Fargo's harshest critic in Washington, called on the SEC to investigate whether the bank committed securities fraud by "failing to disclose problems with fake accounts." For instance, Wells Fargo did not mention the looming settlement or "sales practices" at all when the bank filed an SEC document on August 3, just weeks before the news broke. Known as a "10-Q," that filing requires public companies disclose relevant information about their business to investors. Wells Fargo has previously defended its lack of disclosure. Stumpf told a Congressional hearing into the scandal that "the facts and circumstances, we believed, were not material." Yet, the fake account scandal has clearly had a dramatic impact on Wells Fargo. Not only did Stumpf abruptly retire under pressure, but Wells Fargo's new account openings have plunged and its stock price slumped to a two-and-a-half-year low. Even on Thursday, Wells Fargo acknowledged to investors that the "negative publicity or public opinion" resulting from the scandal "may increase the risk of reputational harm to our business." The SEC did not respond to a request for comment. Wells Fargo declined to comment on the specifics of what the SEC is investigating. In an emailed statement to CNNMoney, Wells Fargo said it's "committed to restoring trust with customers and all of its key stakeholders" and listed a series of steps, including eliminating controversial sales goals and appointing new leadership. Besides the SEC, Wells Fargo is grappling with investigations from the Department of Justice and multiple Congressional committees, state attorneys general and prosecutors' offices. Additionally, class action lawsuits have been launched by customers, employees and shareholders who believe they were harmed by the scandal. Wells Fargo is also being investigated by the government over its mortgage tactics. Wells Fargo said on Thursday it's in discussions with the taskforce spearheading the investigation, which could increase the bank's legal costs even more than expected. Bank of America (BAC) reached a settlement worth nearly $17 billion with this taskforce in 2014.